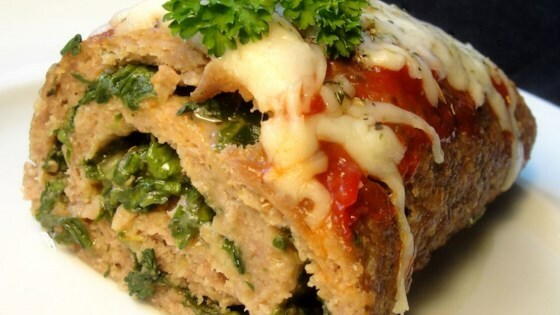 "Italian turkey meat loaf with a surprise spinach filling!" Preheat oven to 350 degrees F (175 degrees C). Line a baking sheet with parchment paper. Place a rack into a broiler pan. Mix together the ground turkey, bread crumbs, egg, 1 teaspoon of salt, and black pepper in a bowl; pat the mixture out onto the prepared baking sheet in a rectangle 10 by 14 inches. In a bowl, place the spinach, 3/4 cup of Italian cheese, 1 teaspoon Italian seasoning, garlic powder, and 1/4 teaspoon of salt. Lightly combine, and spread the spinach mixture over the meat, leaving a 3/4-inch margin. Pick up one edge of the parchment paper, and roll the edge over, starting with the short end. Continue to roll, pulling back the parchment paper as you go, until the meat is a firm roll. Press seam down, and lay the roll seam-side down into the rack over the roasting pan. Bake in the preheated oven until the roll is cooked through and the juices run clear, about 50 minutes. An instant-read thermometer, inserted into the center of the roll, should read 160 degrees F (70 degrees C). Pull the roasting pan from the oven, and spread roll with ketchup; sprinkle with 1/4 cup of Italian cheese blend and 1/2 teaspoon of Italian seasoning. Return to oven, and bake until the cheese has melted, about 10 more minutes. Mix, roll & bake dinner! Use low sodium breadcrumbs!!! This was SO SALTY! !